In Just Cause 3, if you have not got a Wingsuit or a Private Helicopter, we recommend you use the Formula 1 car. This car is quick as lightning and takes you in a few seconds to your destination. However, you should avoid driving off-road trails and mountains. Once the car is damaged by ungentle landings, it goes up in flames in the resounding explosion. - Go to Baia province. This you can do, for example, using the Quick Trip. - Near the west coast, a race named Salrosa Sprint Race will take place. It is one of the many challenges in the game. This is located near the coast and you recognize it on a steering wheel icon. - Once there, you walk in the direction of the street. Soon you will see a truck on the other side of the asphalt. - Right next to the truck you can find the Formula 1 car. In-case if you want to get a new F1 car you can travel to the same location described above and use the following combination codes. 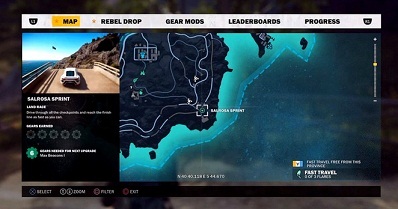 If the particular car cannot be found at this location, you have two ways to obtain it. - Run down the street or circling the mountain. Since the location is dynamic, you could find the formula 1 car at another location nearby. - Leave the location for awhile and comeback again. It may happen that you underestimated the speed of the formula 1 car and therefore you destroy it quickly. However, it is not a problem because after a short time the F1 car reappears at said location. To back up the car, you can park it in your garage.